In this article, I compiled a list of 3 affordable video editing software new YouTubers who are looking for a software to create daily vlogs, travel videos, or how-to tutorials without spending too much money on purchasing expensive video editing suite. Until 2019, YouTube has been one of the biggest video sharing platforms on the planet. Millions of creators publish videos on this platform on daily basic. Many new YouTubers are still struggling with finding a good video editing program which helps them assemble their footage, trimming unwanted part of the clips, and finally render the whole project into the formats they can use to upload on YouTube. It’s because of the misleading information, biased reviews all over the internet. Let’s me help you save your valuable time and effort with this little pieces of important information I’ve learned during the past two years continuously making YouTube tutorials, reviewing video editing software. I promise that these 5 affordable programs are exactly what you need to getting started. On top of the list, I recommend you to try Filmora 9, a free video editing software of Wondershare. This program has everything you need to make YouTube videos. It is a feature rich program, packed with tons of preset title template, transitions, powerful color grading tool and audio mixer. For those of you who want to make vlog, travel videos, or product reviews, Filmora 9 is one of the best options to use. Watch below short overview of Filmora to learn more about it. Filmora 9 is the easiest video editor I’ve seen so far. The interface is clean and clear so that you can start making video right after installing the program on your computer. It’s also very lightweight program, meaning you can edit video smoothly on your old, low-end computer. I am currently making video on my weak Dell XPS Laptop without any lag at all. Rendering video speed is among the fastest ones. Out of the basic editing tools, Filmora also has advanced features such as Chroma key, Video stabilization, audio keyframe, built-in music library, LUT and lots of video effects. All these features are included when you purchase the software. Its free version has a big watermark on the output. It does not include motion tracker, 360 editing tools, or multi-cam editor which are very common nowadays. It crashes very often especially when you are working with a big project with tons of footage, and images. 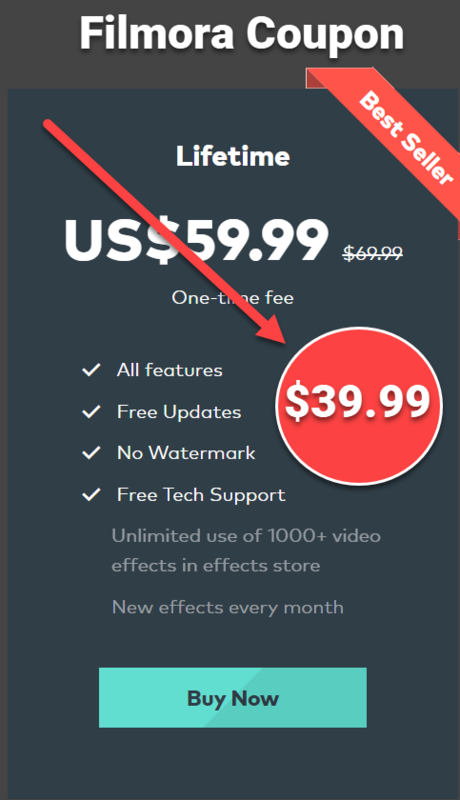 Filmora 9 has different pricing plans for individuals and business. For new YouTubers, its individual lifetime license is highly recommended. It is $59.99 only. It has shorter learning curve than some other professional video editors on the market. This video editor can work well on low-end laptops, Windows or Mac. Movavi supports most common input/output formats. Movavi has load of title presets, filters, transitions, background music, free intros and outros. It also includes advanced video editing features such as green screen effect, video stabilizer, auto beat detector and automatic video creation tools. Video rendering speed is among the best one on the market. Movavi does not have a free version. You can only try this program in 14 days. You can add maximum 5 tracks on the timeline only. Movavi technical support service is not as I expected. Like Filmora, Movavi also has different pricing plan for personal, or business. For new YouTubers, Movavi video editor is a good option to go. ActivePresenter is a completely free video editing suite for those of you who getting started making how-to tutorials for your new YouTube channel. This program comes along with a high quality screen recorder, and powerful video editor with many useful features for creating training videos. It’s compatible for both Windows and Mac. Check out this introduction video to learn more about it. It is complete free software. You don’t have to worry about output watermark, or feature restriction. It is as easy to use as MS PowerPoint. The main work space looks very similar to this famous progam of Microsoft. Tons of advanced features for creating educational videos. As it’s designed for screencasting and eLearning, ActivePresenter lacks of color grading tools and preset templates. Building a new channel, you will need to invest your money on a bunch of other equipment like camera, computer, lens, and so many thing more. However, selecting the right video editing software is as important as above mentioned equipment. I hope this piece of information can really help you save your time and effort. If you have any question about these program, leave your comment below. Don’t forget to follow us to keep you up-to-date with our new article in the future.